This last week has been hard. I feel so lonely, so out of place, and so stressed about everything that is going on. Why did I think staying is school for 8 years was a good idea? I really should have taken some time off. All I do all the time is cry, and during this time of hysterical crying, I realize how difficult it must be to be my friend/boyfriend/family. I am nothing but a ball of stress all the time. I really think I would hate to be around myself sometimes. Yet, I have the most amazing group of people that deal with me on a regular basis in my times of crying, complaining, worrying, and stress and somehow they still want to be around me. I am sure they will all eventually form a support group: "Dealing with Ginger: The First Steps". I could not be more grateful to have them in my lives, I would not be able to make it through these times without them. The next two weeks of school are going to be hell. I have a presentation tomorrow and an exam on Wednesday. The following week consists of an exam on Monday, presentation on Wednesday and a paper due on Thursday. I have pretty much kissed goodbye any free time I might have, but I am looking forward to it all being over, which will be in less than two weeks. This past week, when I was on Skype with Jared, I told him that I wanted to just drop out of school, buy a pony and run away with it. Silly I know, but it was a serious consideration for a while. A couple of days later, I find that I have a package at the front office. I am thinking to myself "What did I order?" 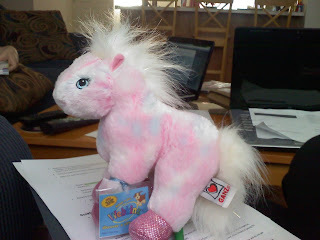 On my way to Cassie's to study I swung by the complex and picked up the package to find that it is a stuffed pink pony. The next hour consisted of me calling my parents asking about the pony, looking at my bank statements making sure I did not accidentally buy the pony, texting my friends about the pony and of course calling Jared. I have decided to call her Panic Pony (although I need a real name for her....suggestions?) and she is the perfect reminder of how much I am loved and thought of while I am alone down here in South Carolina. I know that it will get easier, and I am getting better day by day but going through these tough times alone make me realize how much my friends and family mean to me. My mother and sister came down around 6:30pm last night because they knew I needed to see a friendly face. It was so wonderful to see them, but it hurts so much at the same time. However, in true South Carolina fashion, something went wrong when we went out to dinner. We had dinner at Red Lobster and just as we were ordering our drinks, two men from the kitchen ran outside and started attacking each other right outside our window. I mean full on attack. Next thing you know, all of the employees of the restaurant run outside to pull them off of each other. I have never seen anything like that before. The police were called and they were arrested. Needless to say it was a great way to say "look at where I live Mom, totally safe"
All I could think of the minute you left was "I want my mommy." I haven't thought that since I was two!